Hello and Happy Tuesday! I hope you had a wonderful weekend! I made Jeff his very favorite soup on Valentine's Day! It is an Italian Sausage, Bean and Pasta soup recipe and although it takes a while to cook it is definitely worth the wait! 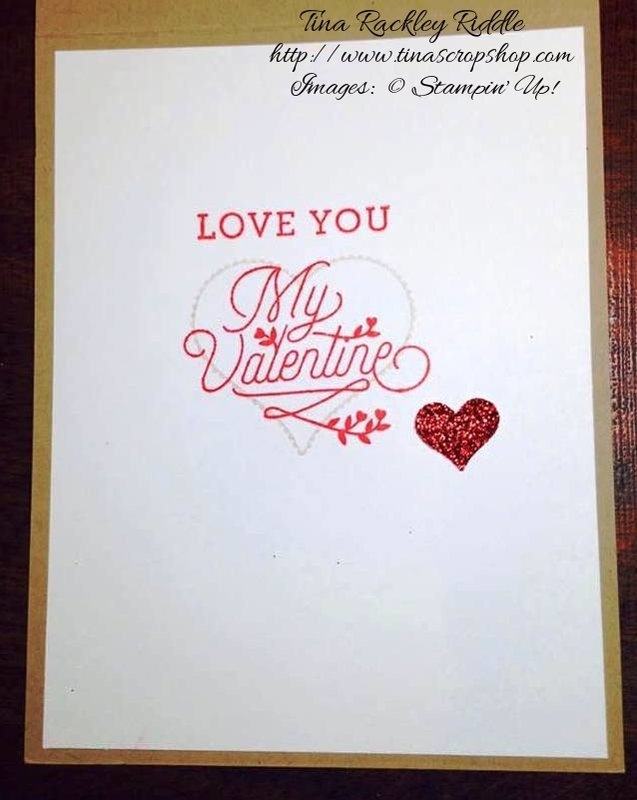 I know you are probably over Love themed cards about now but I have one more to share with you! 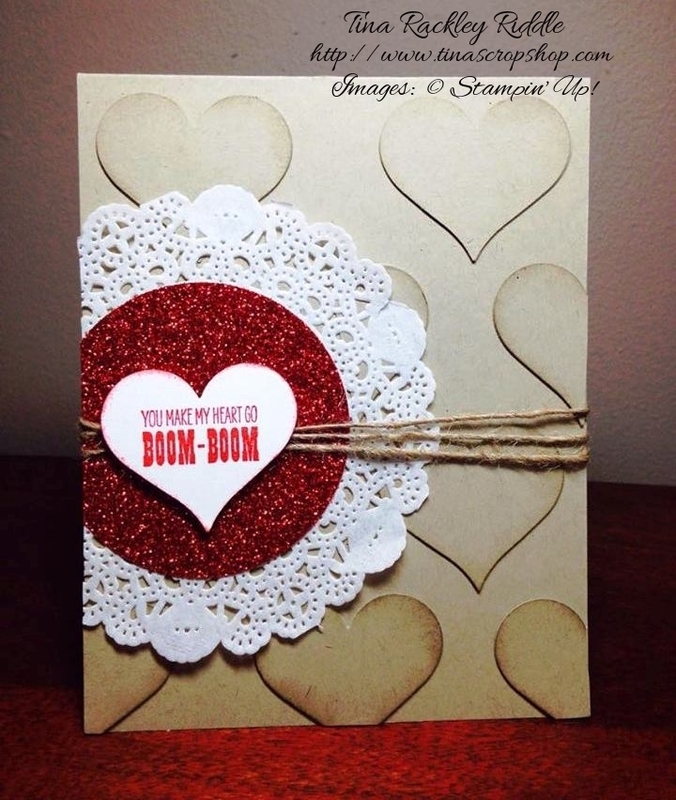 Our Anniversary is four days after Valentine's Day so I had one more card to make. 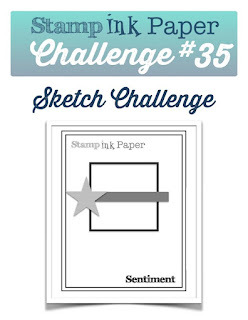 This week's Stamp, Ink, Paper challenge gave me plenty of inspiration! 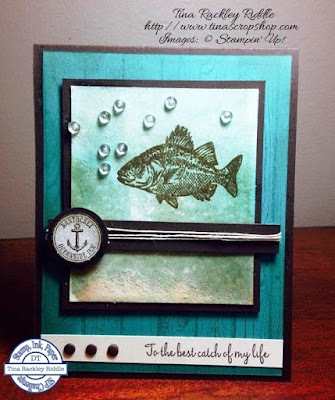 Jeff's favorite hobby is fishing so I combined the Stampin' Up! By The Tide stamp set and Hardwood stamp with an awesome Gina Marie fishing stamp set (for the sentiment) and came up with this! On This one I started with a 11" x 4 1/4" piece of Early Espresso cardstock that was scored at 5 1/2". 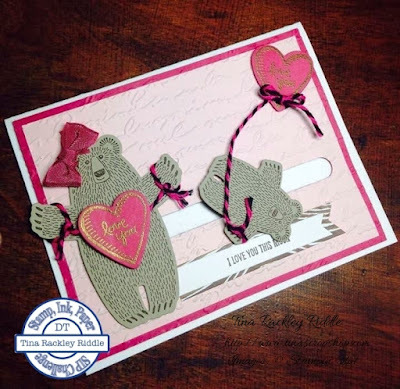 My next layer was Bermuda Bay cardstock that was stamped with the Hardwood stamp tone on tone with Bermuda Bay Ink. I sponged some Crumb Cake ink to give the edges a weathered look. My watercolored layer was 3" x 3 1/2". I used the smooshing method to add Sahara Sand, Pear Pizzazz, and Bermuda Bay Ink to my watercolor paper. Have you ever smooshed?? It's so simple. I apply ink from the pad directly onto the a large acrylic block. 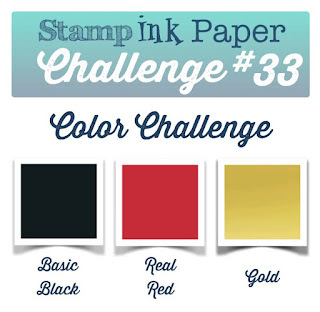 I'll use three different colors of ink in blocks of color on the block. After applying the ink, I spritz it with water and then turn the block over and press it down to smoosh it onto the watercolor paper. I allow to sit on the watercolor paper a few minutes. After drying it with my heat tool, I rubbed on some Versamark ink on the bottom and then sprinkled heat and stick powder on top of that. I then used my heat tool to heat it and make it sticky. Then came something unexpected... Pink Himalayan Sea Salt was ground over the sticky heat and stick powder. It turned out really cool and looks so much like sand! I heat embossed the fish image with gold embossing powder and added some Pretty Pink Posh clear droplets. 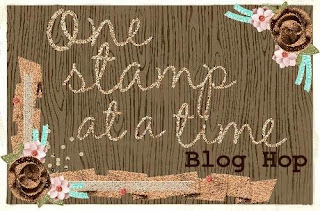 My watercolored layer was matted with a 3 3/4" x 3 1/4" layer of Early Espresso and added to the Bermuda Bay hardwood layer with Stampin' Dimensionals. I added a 1" x 3 1/2" strip of Early Espresso that had twine wrapped around it horizonally three times and knotted. 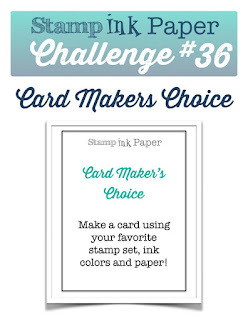 I stamped the Nantucket anchor emblem with Early Espresso Ink onto Very Vanilla cardstock. Since I didn't have the right side of punch to punch that circle out I fussy cut it and then added a 1" circle of Early Espresso cardstock behind it to hide my terrible circle fussy cutting! lol The sentiment from the Gina Marie Fishing Stamp Set was stamped on Very Vanilla cardstock with Early Espresso Ink. I added three Early Espresso Candy Dots to balance that layer out. Jeff is such a fishing fan, I know he'll love it and he really is the best catch of my life! Hello and Welcome to the February One Stamp At A Time Blog Hop! If you have already been hopping you should have landed here from the amazing blog of Maria Willis! 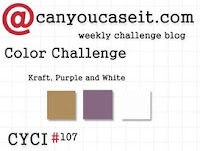 If you missed it, you will definitely want to make sure you check it out! Maria has become one of my favorite card designers! She has such a fresh and unique style that I really LOVE! By now you probably already know that this Hop is all about Love! I took this opportunity to make my sweet Hubby a Valentine's Card and a little treat box. We've been trying to not eat as many sweets (we both have a sweet tooth!) so this is just the perfect size for a few chocolates and everyone needs a little chocolate for Valentine's Day! Here's my card and project! And a close up of the card! 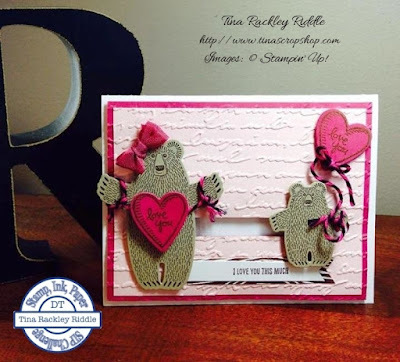 I can tell you that this card is much simpler than what I typically make. I can't remember the last time I made a card that didn't have at least 3 full layers. lol All that being said, I really like the way this turned out. My cardbase was a 11" x 4 1/4" piece of Crumb Cake Cardstock scored at 5 1/2". With my Sweetheart punch, I punched out Crumb Cake hearts and arranged them onto the base and adhered them with snail. I then punched out more Crumb Cake hearts that I sponged with Crumb Cake Ink around the edges and adhered to the first layer of hearts to give them more dimension. I added a Tea Lace Doily with snail and punched a 2 1/4" circle of Real Red Glimmer Paper and adhered to the middle of the doily. I trimmed the Doily and circle at the left edge of the card. I ran three loops of twine around the card front and tied it in the center of the circle. The sentiment from the Groovy Love stamp set was stamped in Real Red Ink onto thick Whisper White Cardstock and then punched out with the Sweetheart Punch. 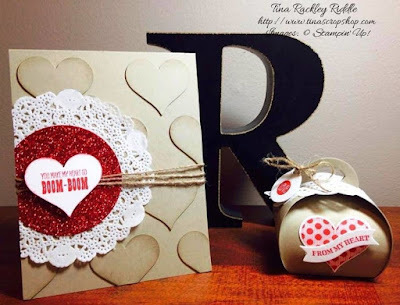 I sponged some Real Red Ink around the edges after punching and adhered over the circle and twine with Stampin' Dimensionals. 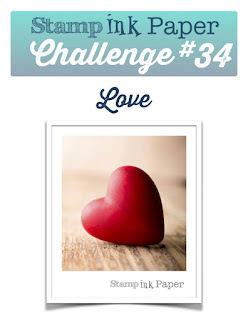 For the inside of my card I stamped one of the larger hearts from the Groovy Love stamp set with Crumb Cake Ink that had first been stamped off to give it a more subtle look. I added the Love You and My Valentine sentiments from the Bloomin' Love stamp set in Real Red. To tie the inside to the outside I added a Red Glimmer Paper small sweetheart punch with a glue dot. Here's a better look at the Curvy Keepsake Treat Box.. I used Crumb Cake Cardstock to cut out my Curvy Keepsake Box. I added a little bit of the Tea Lace Doily on both sides of the top. The heart as well as the From My Heart sentiment were stamped on Thick Whisper White cardstock in Real Red ink. The tag was cut from Thick Whisper White Cardstock as well. 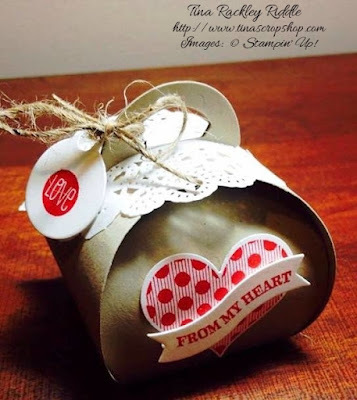 The Love sentiment was also stamped in Real Red and the tag was attached to the treat box with twine. I thought it turned out super cute. 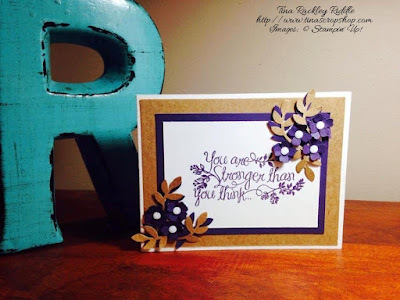 Next up is my sweet friend Megan Thompson's blog! Just click the next button and you'll be there! Here's a full listing of our Bloggers in case you've lost your way! Tina Riddle - You are here!!! Hello! Hope your February is starting off awesome! I can't believe how quickly January just flew by! 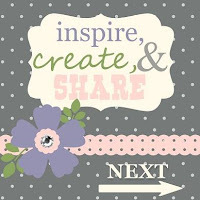 Well of course since it is the first Wednesday of the month, it is time for another Inspire, Create, & Share Blog Hop and this month it's all about It's a Love Thing! How fun is that?? 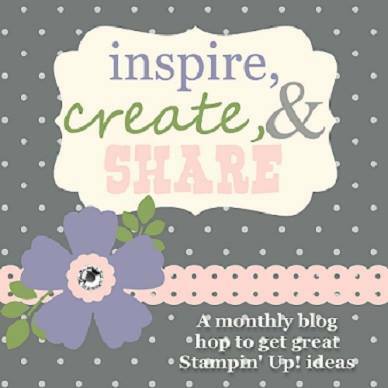 If you have already been hopping you should have landed from the talented Tammy Dunlap's blog! If you missed it, you'll definitely want to check it out! 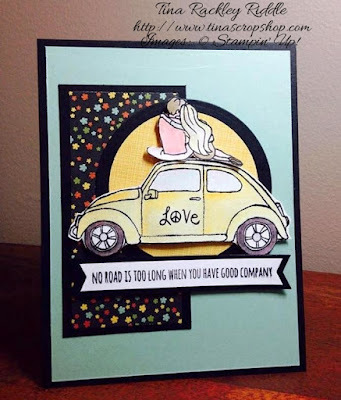 I had so much fun inking up the Beautiful Ride Stamp Set from the Occasions Catalog! 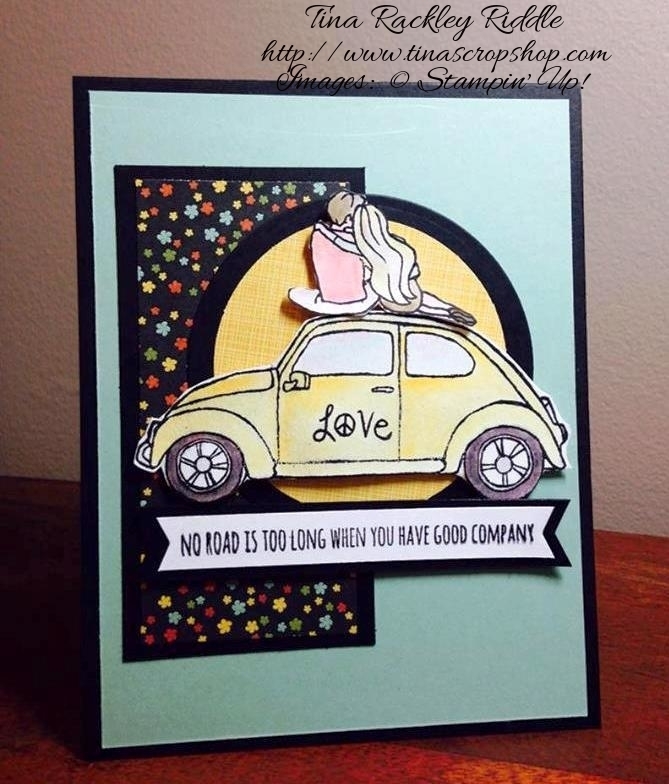 On this card I stamped the car and couple images with Black Archival Ink onto Watercolor Paper and used my Aqua Painters and Stampin' Up! Ink Pads to color them in. Obviously I did a little fussy cutting on them as well. The sentiment was stamped on Whisper White cardstock with Black Archival Ink as well. 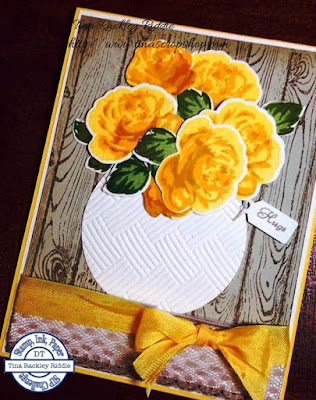 Both the floral DSP and the yellow crosshatch DSP are from Botanical Gardens Designer Series Paper Pack. 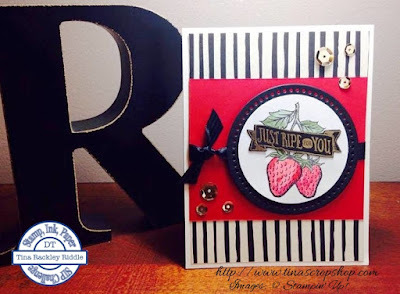 My Card base was Basic Black, with a layer of Mint Macaron cardstock. Next up is the fabulous Darla Roberts blog! Just click the next button and you'll be there!